Harley-Davidson Inc. (ticker symbol HOG) is cashless in Milwaukee. The BizTimes Daily reports Harley-Davidson Warehouse Funding Corp. and Harley-Davidson Credit Corp. subsidiaries’ received $500 million last week in a loan advance from its lenders, which included JPMorgan Chase Bank (recently purchased WAMU) because of their inability to securitize bike loans. Harley has burned through $221 million for the 9 months ending 28th September. They borrowed over $1B (yes, BILLION) in that same period and paid out $225 million in dividends. Harley-Davidson Financial Services Inc. (HDFS) continues to carry some significant bad debt. UBS analyst Robert Farley estimated that HDFS will require $1.5 billion to continue funding its loan operations for 2009. The loan last week only provides $500 million thru March 31, 2009. Indicators suggest that HDFS has not reduced its lending to subprime borrowers (25 to 30 percent of loan portfolio) and the issues will only deepen. Is this a sign of the future and one where HD needs to apply for a bailout? Nearly a third of the people holding retail loans are subprime borrowers. The default rates are increasing and HDFS can no longer sell risky loans as it once did. HD may also be suffering from similar issues as GM — too many dealers (857 according to the dealer locator) and too many models available (6 Sportsters, 8 Softails, 5 Dynas, 3 VRods, 8 Touring, and 4 CVOs — that’s 30 bikes built off just 4 main chassis/engine combos). Add in the Buell models and MV Augusta line-up and you start to get the picture. Motorcycle dealers are struggling to cope with tightening credit and fewer lending sources. With the exception of BMW, Harley and Honda who have their own financial arms the others rely primarily on HSBC and GE Money to underwrite loans. In fact, Sparta Commercial Services Inc. announced it completed its first commercial fleet leasing transaction exclusively for Harley dealers. Leasing has become popular with some Harley dealers as they can avoid having to buy the motorcycles and free up cash flow. Is inventory of used motorcycles stacking up and dealers will be forced to stop taking trade-ins? In the Northwest, dealers get some benefit from the unknown Spokane, WA repo auctions. It’s clear the sensible days are over as we live in a rapidly changing financial world. Disclosure: author owns no HOG. Does the economy need yet another motorcycle company? Or more important will people buy yet another premier motorcycling brand? First it was Indian and now after 15 years of U.S. ownership, Norton’s back in England. Just in time it would seem because the country is experiencing manufacturing sector shrinkage at the fastest rate since records began. It’s the fifth consecutive month of contraction, levels of output, new orders and employment registrations are at unprecedented declines. So, along comes businessman Stuart Garner who bought the rights to the Norton name from an American company in a multi-million-dollar deal that included the Norton, Manx, Atlas, Commando and Dominator brands, and all intellectual property. Unfamiliar with Norton then read SCM’s Paul Duchene’s article on the 1999-2003 Norton Commando VR880 and the 1990-91 Norton F1 Rotary. Spectacular motorcycles and if successful it hits right at the heart of Harley-Davidson Euro growth plans with their new XR-1200. Don’t get me wrong I’m not immediately discounting the Norton brand out of hand. Some of their bikes have been real head-turner’s and as a Harley guy any competition whether it’s Indian or Norton or ? makes them better. But I’m suspicious of those “lifestyle” marketers and demographic strategists grabbing a hold of this and it becoming another Excelsior-Henderson failure? I hope they are successful. I’m a bit doubtful given the financial timing, but at a minimum I’m looking forward to another large t-shirt motorcycle showroom full of iconic logo’s and fashionable clothing based on premium denim and vintage leather. It’s now all about setting the standard for upscale living…T-shirts for $38, sunglasses for $150, sport shoes for $125, after-shave $50, soft terry cloth wash towels $100, and exclusive outdoor furniture sets to match the crystal glasses…for the “puff-n-bluff-n” look at me crowd. Sales people asking me if I can smell the lineage…it’s Déjà vu all over again. 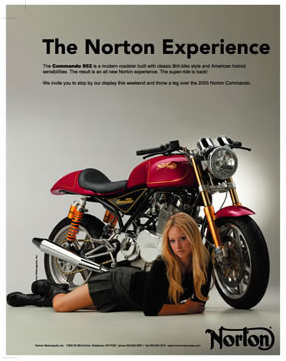 Norton Logo and Ad courtesy of web site. It’s not a good day to be a Harley-Davidson (NYSE: HOG) dealer. The company reported that Q3 profits fell sharply and they tried to reassure investors that company management is taking prudent steps to manage the brand. They also cut earnings outlook and lowered the estimate for motorcycle shipments for the rest of the year. Harley reported that earnings for Q3 dropped 37% to $166.5M from $265M as compared to Q3 of 2007. This is the fifth straight decline in quarterly earnings for Harley. Revenue fell 8% to $1.42B from 1.54B in 2007. Shipments of motorcycles fell 14% to 75,704 although they did report that international shipments were slightly up. Dealer retail sales fell 10% this quarter as purchases of high-end motorcycles are often tied to consumer confidence and the credit market squeeze has compounded the problems. Speaking of credit, the Financial Services segment of the company reported higher delinquency rates this quarter, a 28% decline in operating income and having to raise interest rates for all potential customers. In a downturn climate Harley acquired MV Augsta Group, expanded on European operations, opened the new museum, rolled out MySpace and Facebook sites and hosted the 105th celebration all during this quarter. So, given the daily doses of financial doom and credit circumstances Harley seems to be doing “okay” in trying to weather this slowdown. 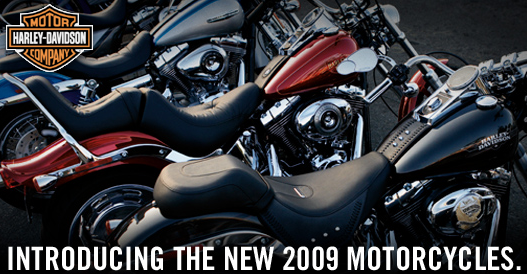 Harley unveiled the changes in their motorcycle line up today in the form of 13 press releases! Call me crazy, but I find it questionable how a PR department see’s value in doing so many press releases in the same day? At any rate, many of the changes feel a bit cosmetic or like minor “updates” with no major new model launched compared to previous years. Maybe I’m biased toward touring bikes, but there was no “Rocker” type equivalent announcement or a news making launch of the U.S. XR 1200 to break through the ever increasing motorcycle market noise. Harley introduced a new frame/swing arm for touring models. It has 50% fewer parts and 60% fewer welds which result in better maneuverability, heat management, luggage capacity and rear-tire life due to the new Dunlop D407 Multi-Tread tires. Touring models have new 17-inch 28-spoke “cast” aluminum wheels, 180mm rear tire and a new exhaust system that passes under the frame vs. under the seat. Exception is the Road King Classic. In an acknowledgment of the “widening-girth-of-America” the cargo/passenger capacity was increased approx 70 pounds and slightly larger injection-molded saddlebags were added this year. The Road King Standard has this funky Red colored light (vs. amber) on the front fender..gives it a police special look. The V-Rod gets “Muscle” (as if it didn’t have enough already! ), a new model with a heighten angular appearance over the standard model. It has air scoops eerily similar to the mid-80’s Yamaha V-Max. The Screamin’ Eagle treatment from the Custom Vehicle Operations (CVO) is added to the Fat Bob and Road Glide models. I don’t see these changes creating a lot of additional demand or perking up sales in the near-term for heavyweight motorcycles, but Harley has taken some solid steps to improve their line-up. 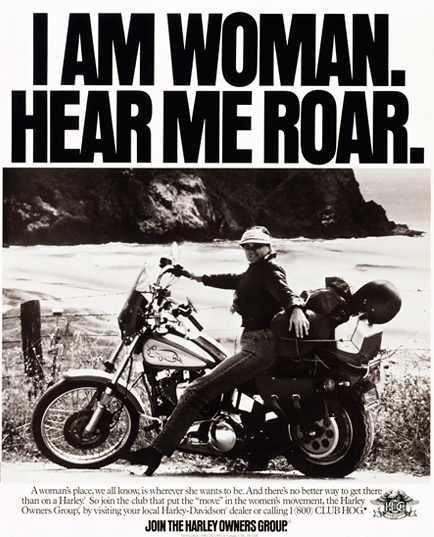 More women than ever are choosing to ride motorcycles as their main leisure activity. This bit of trivia is according to a recent survey by J.D. Power and Associates, where 12 out of every 100 motorcycles are sold to women – a 20 percent increase since 2003. However, that’s just not enough women buyers for Harley or they aren’t getting a disproportionate share of those women buyers because the company marketers have spun up another promotion targeted exclusively for women. 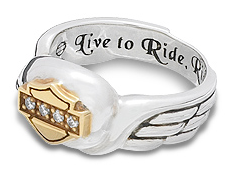 The deal is that every women who graduates from a Rider’s Edge course AND purchases a new Harley-Davidson motorcycle now through October 1, 2008 will receive a diamond ring. This comes as no surprise from a highly male marketing team. Motorcycling is a male dominated sport and there is very little information out there that speaks directly to woman’s interest in riding or getting her own bike…call me crazy, but today’s woman rider is college-educated earning $50,000 or more and is a role model in her community…do “diamond ring” stereotype’s really work and influence women to make a purchase decision? This is so yesterday’s news. The Harley marketing staff needs to get a clue and bring on a few dozen female college interns to regain perspective.